This spectacular Native American sterling silver & Pilot Mountain Turquoise bracelet was created by the late Navajo silversmith, Kirk Smith. 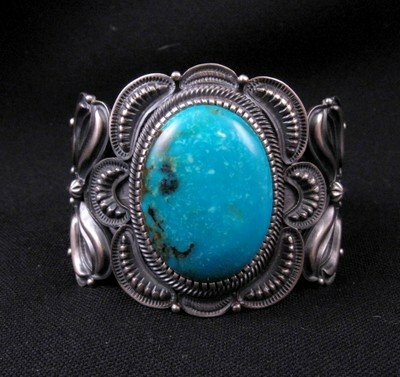 Kirk made distinctive old pawn style jewelry that's among the most sought-after Native American jewelry in the southwest. 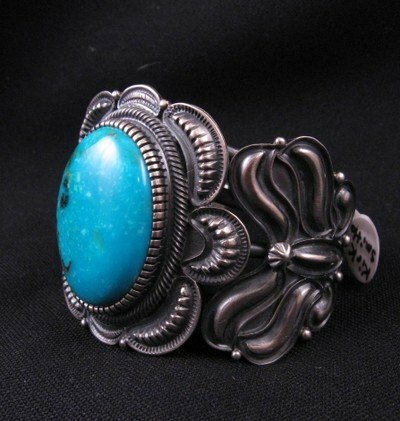 This bracelet features a large genuine Pilot Mountain turquoise stone set on a old pawn style silver cuff covered with fancy applied repousse silver work, twisted wire, stamped hogan beads, silver raindrop beads and scalloped edges. The high grade Pilot Mountain turquoise stone is deep sky blue color and in perfect condition. It measures 1-1/4 by 1. The stone is set in a deep fancy filed bezel on a five wire shank cuff with the old pawn finish for which Kirk Smith is known. 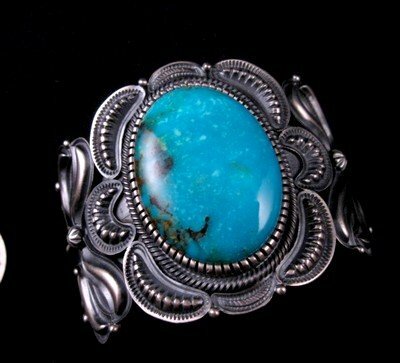 Kirk usually sets his jewelry with high-quality stones in vibrant colors with interesting natural matrix patterns. His pawn finish mimics the appearance and patina of naturally aged sterling silver. The bracelet measures almost 1-3/4 wide at the front narrowing to 1/2 wide at the terminals. It has an inside end-to-end measurement of 4-3/4 plus a non-adjustable opening gap of 1. It is designed for a small wrist. My wrist is 6 around and it is too small for me. The bracelet weighs 77.5 grams. Brand new in perfect condition. Stamped sterling and has Kirk Smith's hallmark on the inside of one of the bracelet terminals. Certificate of Authenticity included. Kirk came from a well known family of silversmiths and he began working with silver as a youngster at his grandfather's workshop. He made jewelry off and on until 1980, when he resumed silversmithing full time, learning from well-known artist and brother-in-law Harry Morgan. He became an acclaimed artist is his own right by consistently creating investment quality old pawn style jewelry. 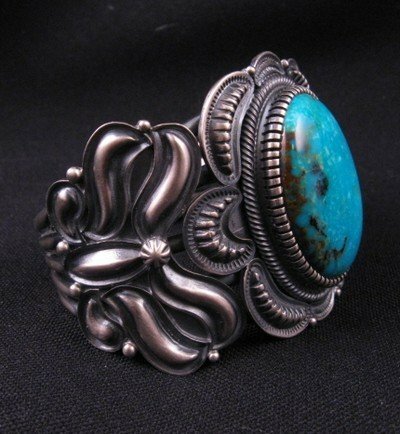 With heavy silver, detailed craftsmanship and beautiful stones, Smith's pieces won many awards throughout the years. Kirk Smith died tragically on Monday, September 17, 2012. He will be deeply missed by friends, family and Native American Indian jewelry collectors and traders everywhere. At the time of his death, Kirk had most definitely surpassed his mentor, the late Harry Morgan, to become the best practitioner of classic revivalist Navajo motif.